Utah Royals FC tied the North Carolina Courage 0-0 at Rio Tinto Stadium in Sandy, Utah, on Friday night, to finish out the season series between the two teams. Utah is the only team to not to lose to North Carolina this season, finishing 1-0-2 against the team at the top of the table. The Courage could’ve clinched home-field advantage in the playoffs with a win tonight, and possibly the NWSL Shield if Seattle Reign FC lost or drew tomorrow — but that’s all on hold until the international break is over and the team is back in action on August 5. They’re now 14-1-4 (46 points) and still well clear of their nearest competitors. Utah Royals FC are now 5-6-7 with 22 points following the draw, but six points back from a playoff spot. Last month, Utah Royals FC dealt the Courage their only loss of the season, 1-0 on a late, stoppage time stunner from Brittany Ratcliffe. This time around, it was a defensive battle between the two sides. Both teams were missing a number of key starters due to U.S. women’s national team training camp ahead of next week’s Tournament of Nations. For North Carolina, McCall Zerboni, Crystal Dunn, Merritt Mathias, Jaelene Hinkle, Abby Dahlkemper and Sam Mewis were all out. For Utah, Becky Sauerbrunn, Amy Rodriguez and Christen Press missed the match. Utah Royals FC made two key defensive plays to preserve the draw. The first, a save from Nicole Barnhart in the sixth minute. Barnhart was starting in place of Abby Smith, who missed the game with a concussion. The play started with a North Carolina corner kick, that was headed out wide in the direction of Debinha. The midfielder then served the ball back into the mix for Abby Erceg to head on frame. Barnhart was going the other way, but then dove back to her right to palm the ball out of danger. Barnhart make four saves on the night to earn the clean sheet. In the 88th minute, Rachel Corsie came through with a sliding block on Lynn Williams to keep North Carolina off the scoreboard. After a giveaway in midfield by Utah, North Carolina quickly sprung forward on the counterattack. Heather O’Reilly, starting at right back, played a long through ball to Williams, who was in a full sprint with lots of room to run. Williams dribbled into the box, but Corsie raced back from the other side of the field to slide in and clear the ball out just as Williams took her shot. Corsie finished the evening with four clearances, two interceptions and one block. The game saw no shortage of key defensive plays throughout, with both sides making near back-to-back stops in the first half. First, Utah defender Becca Moros stepped up to steal the ball away from Williams on a North Carolina opportunity. Moros finished the match with a game-high 97 touches, won nine of her 10 duels and made two interceptions. Then, Courage defender Meredith Speck stepped up to calmly clear the ball away on a quick Utah Royals FC chance. Speck started at left back for the Courage in the game. Courage defender Kaleigh Kurtz, starting at centerback in place of Dahlkemper, made a game-high seven clearances. Courage goalkeeper Katelyn Rowland needed just one save to record her fifth clean sheet of the season and North Carolina’s ninth overall. Utah Royals FC dominated the Courage in possession 59.4% to 40.6% — but North Carolina led in total shots by a large margin of 21-5. The Courage put just four on frame to Utah’s one. The draw for the Courage breaks a five-game winning streak that began following their loss to Utah last month, but they are still unbeaten in their last six games. Utah Royals FC are 0-3-1 in their last four games and have won just one of their last seven games since the win over North Carolina. 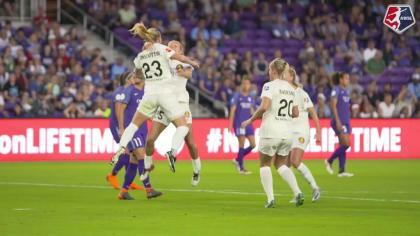 The Courage will get another shot to clinch the a home playoff game, and possibly the NWSL Shield on Sunday, August 5, when they host Portland Thorns FC. Utah Royals FC will also be in action on August 5, on the road at the Houston Dash. Match ends, Utah Royals 0, North Carolina Courage 0. Second Half ends, Utah Royals 0, North Carolina Courage 0. Attempt saved. Lynn Williams (North Carolina Courage) header from the centre of the box is saved in the bottom left corner. Attempt missed. Lynn Williams (North Carolina Courage) left footed shot from the centre of the box is too high. Assisted by Abby Erceg following a corner. Attempt blocked. Lynn Williams (North Carolina Courage) right footed shot from the right side of the box is blocked. Attempt blocked. Lynn Williams (North Carolina Courage) right footed shot from the right side of the box is blocked. Assisted by Heather O'Reilly. Darian Jenkins (North Carolina Courage) wins a free kick in the defensive half. Attempt missed. Erika Tymrak (Utah Royals) right footed shot from outside the box misses to the right. Assisted by Katie Stengel. Substitution, North Carolina Courage. Yuri Kawamura replaces Cari Roccaro. Corner, Utah Royals. Conceded by Debinha. Substitution, Utah Royals. Erika Tymrak replaces Taylor Lytle. Cari Roccaro (North Carolina Courage) wins a free kick in the defensive half. Offside, North Carolina Courage. Lynn Williams tries a through ball, but Darian Jenkins is caught offside. Substitution, Utah Royals. Lo'eau LaBonta replaces Diana Matheson. Attempt missed. 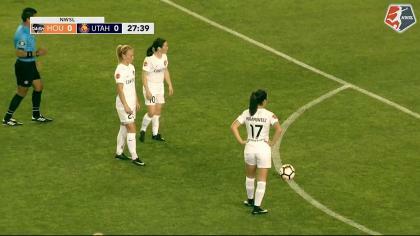 Samantha Johnson (Utah Royals) right footed shot from the left side of the box is just a bit too high following a corner. Corner, Utah Royals. Conceded by Cari Roccaro. Attempt saved. Katie Bowen (Utah Royals) right footed shot from outside the box is saved in the centre of the goal. Assisted by Rebecca Moros. Attempt missed. Denise O'Sullivan (North Carolina Courage) right footed shot from outside the box misses to the right. Diana Matheson (Utah Royals) wins a free kick on the left wing. Foul by Heather O'Reilly (North Carolina Courage). Meredith Speck (North Carolina Courage) wins a free kick in the defensive half. Attempt missed. Lynn Williams (North Carolina Courage) left footed shot from the right side of the box is close, but misses to the left. Assisted by Kristen Hamilton. Corner, Utah Royals. Conceded by Kaleigh Kurtz. Hand ball by Kristen Hamilton (North Carolina Courage). Attempt missed. Kristen Hamilton (North Carolina Courage) left footed shot from outside the box is high and wide to the left. Assisted by Denise O'Sullivan. Attempt blocked. Katie Stengel (Utah Royals) right footed shot from the left side of the box is blocked. Attempt saved. Kristen Hamilton (North Carolina Courage) right footed shot from the centre of the box is saved in the top centre of the goal. Assisted by Jessica McDonald with a cross. Attempt missed. Jessica McDonald (North Carolina Courage) header from the centre of the box misses to the right. Assisted by Debinha with a cross following a corner. Attempt blocked. Kristen Hamilton (North Carolina Courage) left footed shot from the centre of the box is blocked. Assisted by Debinha. Attempt missed. Lynn Williams (North Carolina Courage) right footed shot from the centre of the box is close, but misses to the right. Assisted by Debinha. Second Half begins Utah Royals 0, North Carolina Courage 0. First Half ends, Utah Royals 0, North Carolina Courage 0. Attempt missed. Jessica McDonald (North Carolina Courage) right footed shot from the right side of the box is high and wide to the right. Assisted by Cari Roccaro with a through ball. Corner, North Carolina Courage. Conceded by Desiree Scott. Offside, North Carolina Courage. Cari Roccaro tries a through ball, but Jessica McDonald is caught offside. Attempt missed. Jessica McDonald (North Carolina Courage) right footed shot from outside the box is close, but misses to the right. Attempt blocked. Diana Matheson (Utah Royals) right footed shot from outside the box is blocked. Corner, Utah Royals. Conceded by Heather O'Reilly. Attempt missed. Kristen Hamilton (North Carolina Courage) right footed shot from the centre of the box misses to the left. Corner, North Carolina Courage. Conceded by Rebecca Moros. Attempt missed. Abby Erceg (North Carolina Courage) header from the centre of the box misses to the left. Assisted by Heather O'Reilly with a cross following a corner. Attempt missed. Lynn Williams (North Carolina Courage) right footed shot from outside the box is close, but misses to the left. Assisted by Jessica McDonald. Attempt missed. Lynn Williams (North Carolina Courage) header from the centre of the box misses to the left. Assisted by Denise O'Sullivan with a cross. Attempt saved. Abby Erceg (North Carolina Courage) header from the centre of the box is saved in the bottom left corner. Assisted by Debinha. Attempt missed. Lynn Williams (North Carolina Courage) right footed shot from long range on the right is too high. Assisted by Jessica McDonald.